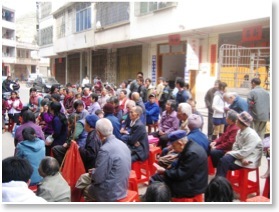 A Street Meeting In China! I greet you in the lovely name of our Lord Jesus. The last few weeks has been a great time for the saints in Cloverdale Bibleway. 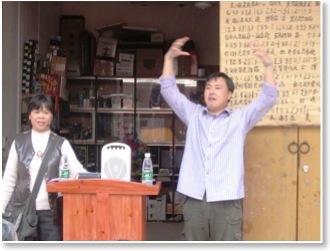 The mighty God came down and changed people’s life dramatically. We can truly say that God reviving His Bride now. 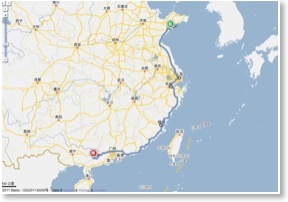 But not only in here, it’s in China too. Brother David and other two brothers braved the extremely cold and harsh winter weather in the last two weeks more than 3000 kilometres (1800 miles) from his hometown down to the south to share the Message with some new places he recently got contacted with. They arrived at Brother Lv’s place last week then immediately went to the church about one hour away that just had a quite stir not long ago. 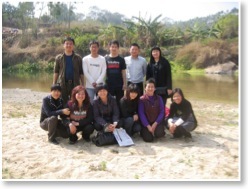 It first start from Brother Zhang a freelance publisher who get this Message through a C.O.D. (Church Order & Doctrine) book that we gave him for the purpose of giving us a quote how much will cost to re-print. As he read the C.O.D. book he believed this is the Truth and baptized. Actually he download and read 140 messages within a month. He witnessed to other people immediately and wanted to share this precious Word with them. Then Brother Lv and myself went and baptized him and his wife together with other thirty people from one of the house churches Brother Zhang witnessed to. Then the chain effect started. The sisters and brothers in that little house church start to witnessing with such a fervency and urgency in the park, on the street, to their neighbour…Brother Lv and other brothers goes every week to minister to the people and lead them into a deeper relationship with the Lord. 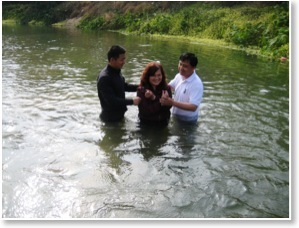 Within two month there are more than twenty were baptized and added in the body of Christ. One of the sister who was baptized last year brought this Message back to her hometown and introduced to her family and other Christian friends. Then they want to hear more. At the same time Brother David arrived with other brothers after many days on the road. So they immediately loaded with the books and CDs together with this sister (Sister Choy in above photo) and another sister (Sister Lynn on the left photo) that just baptized last month who worked in a landscaping company (please refer to the China Update January 6th, 2011). They drove eight hours to that place but find out what waiting for them is a cold rejection from the pastor in that house church. He told them he believe this is a cult and ask them to leave. What a discouragment! It seems the door was closed from the church leader. But the brothers know what their stand and know God must have souls in this place. Sister Choy then invited Brother David to her house to minister and she’ll invite people come. When time of service came Brother David walked out he was surprised to see the room was full! People are hungry. After the first meeting they decide to move to another sister’s shop as it’s bigger place. They arrived at the shop and people already waiting. Brother David stand at the door facing inside the shop but very soon the shop was packed with people. Then sister suggest, “Well, we might as well let the people all sit outside and Brother David you facing the street and preaching.” It’s a dangerous thing to do but they had no choice. So Brother David ends up to have a street ministry and preach facing the hungry people that sit on the little chairs lined up the street. Sister Choy has to translate for him with a loud speaker because the older people only understand their dialect and their hearing is not very good. The loud speaker echoed the whole street. Then the bicycles passing by stopped, motorcycles brake, people walk by stop and listen. 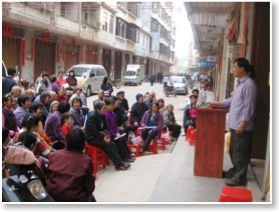 Before long the whole street are crowed with people to listen to the preaching. Then the brothers and sisters that with Brother David seized this opportunity and passing out the tracts and CDs to all the people on the street. After Brother David done, all the books and CDs are done too. After the meeting, one lady came to Brother David and ask if they can baptize her. So they took her and three other friends with her back home and explain to them about the Word. While Brother David was sharing one of the lady said she was quite struggle with the baptism and don’t know if she should be re-baptized or not. Then Sister Lynn start to share her testimony. She said she was struggled for almost one month with the baptism but finally the Lord revealed to her it’s the Truth. This lady was so touched by her testimony and the questions were solved. She said she wants to be baptized tomorrow. Then one of the three lady said in a more or less mocking way that, “If the Lord is true then let Him make me struggle.” After she said that, she get home and she did nothing but struggled all night long. The Lord dealing with her she couldn’t sleep but think about the Word that she heard. After the meetings Brother David thought there should be two people come for baptism. So they waited the next day and when the time come they saw a car pulled over and it’s a police car with siren on! You can imagine what goes through Brother David’s mind by now. But before he figure out what happened the driver came out. Brother David was shocked when he saw the driver. The driver is that lady that struggled all night. She’s a police officer. No wonder she struggled! But now the struggle is over. She wants to be baptized too. Then instead of two people wants to be baptized totally eight people came out of the car. They all want to be baptized. What happened is when that the three ladies came home they start to tell their friends and relatives. Then they all want to come. So Brother David explained to them about the Message of this hour. Then he asked them if they still want to be baptized. They all unanimously said, “Yes.” The water is cold but hearts warmed. All those eight people were baptized in the name of our Lord Jesus Christ. Then the battle started. 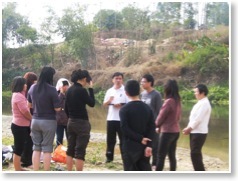 The leader of the house church reported them to the 3-self church after they baptized. When come to the persecution of the Bride all the denominations have unity. Now the 3-self church has its eyes on the new believers in that place and further more they also watched Brother Lv’s church as well because it’s the people from there shared this Message to them. But how we thank God that His eyes also watching His children! Praise be to God! So please remember those saints in your prayers. May all the glory and honour be to our God.